Platinum wedding rings for men and women have become the most sought after choices for wedding jewelry. Platinum wedding rings have become the most popular types of wedding rings for both men and women. Today’s modern couples appreciate the allure and beauty of platinum wedding rings for men because they are the top standard of wedding jewelry. Our platinum wedding rings guide makes it easy for you to choose your preferred style. We offer a large selection of platinum wedding rings at affordable prices. 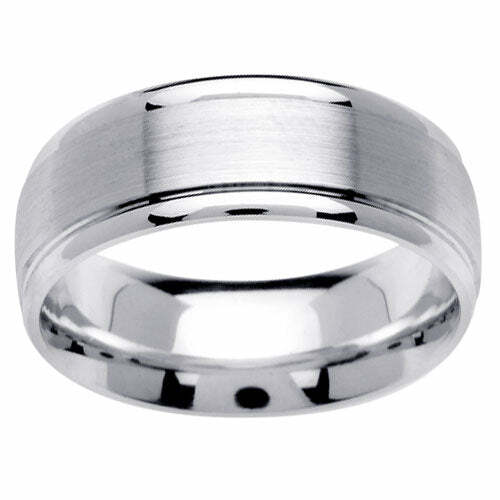 Platinum wedding rings for men are pure white in color and unlike white gold; platinum jewelry is almost pure platinum. Our platinum wedding rings are created with platinum 950, which is 95% pure platinum and 5% iridium, which is a rare white metal found in the platinum family. 18kt white gold jewelry consists of 75% gold and 25% other alloys and is then coated with rhodium. Platinum wedding rings do not require rhodium plating. The purity of platinum is one of the reasons that platinum jewelry is more valuable than that of gold. Platinum wedding rings for men are denser than gold rings and will feel heavier than an 18kt white gold ring. This accounts for the price difference between gold and platinum jewelry. However, we offer the best prices on platinum jewelry and even offer 30-day returns and exchanges on all non-engraved and non-custom items. If you would like further assistance in finding the perfect ring for you, please do not hesitate to contact one of our commission-free customer service representatives at your convenience. Your complete satisfaction is our priority.